WineAspect B.C. Bulk Wine Brokers Ltd.
Our services - WineAspect BC Bulk Wine Brokers Ltd.
- Sign up for our Newsletter - New enhanced website coming soon! At times, a Winery finds itself with Wine that it cannot use, due to heavier crop loads. At other times it is in need of Wine, due to a lighter crop. Sometimes marketplace demands lead to surpluses or deficits of wine. Another Winery may be in the situation where it has no particular problem of over or under supply, but finds itself in need of “blenders” to flesh out the wine that it has. All these Wineries are in need of a trusted and confidential brokerage Company. That’s where WineAspect comes in. At WineAspect, we offer professional expertise and dedication to help you source the best Bulk Wines for your needs or to find a Buyer in need of your excess. Our expertise and confidential brokerage services are designed to help you find the best match possible for your wine exchange transaction. We focus on the B.C. Wine Industry, promoting every aspect of it! At WineAspect, we offer independent Custom Wine Evaluation and Appraisal Services to the British Columbia Wine Industry, including feedback on the quality, marketability and current demand in the British Columbia marketplace for Bulk Wines. We also provide Vineyard Assessments, for existing Vineyards or new developments. Mark Wendenburg, of Wendenburg Wine Consulting Ltd. born and raised in the Okanagan Valley, Oenologist and recognised Winemaker, is dedicated to conveying expertise for any of your requirements. 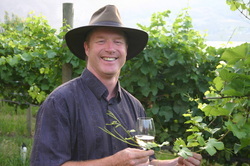 His knowledge and experience in crafting Wines has earned him a highly respected reputation in the British Columbia Wine Industry.